Just Let ME Do It!!! I gripped my hands together, white knuckles blazing, praying to God while rolling my eyes and sighing deeply. I asked for patience. For a power outage. For a change of heart on his part. For a miracle & automatic proficiency. Nothing. Crickets. Just slow moving of the mouse. Whispering under his breath. And…improperly sized fonts and photo placement. A few weeks back, on a Sunday afternoon (the same day as the NFC Championship Game to be exact) my seven year old decided it was time to produce and direct the creation of this year’s valentines. If you watched or heard anything about that game, you know the last half of the fourth quarter was pretty insane. Being pulled away to set up photo shoots and guide LEGO placement was not my top priority. I am a fair weather sports fan, but seeing the Seahawks in the Super Bowl for another year is pretty exciting for this former Washington State native. And thus, I was a little bit distracted. 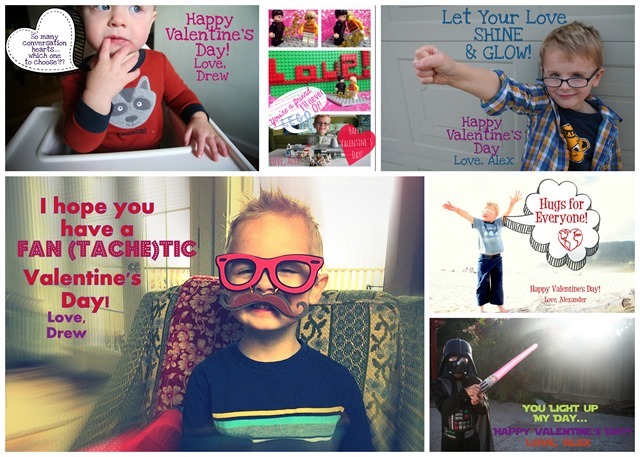 Each year, we create photo Valentines as they can be a bit more personal and individualized. I have had many parent acquaintances comment that seeing the actual face of their child’s classmate is also helpful with connecting names with identity. Sometimes we’ll doctor up a photo we already took earlier in the past year. For the past two years, however, my eldest has wanted to create a brand new photo narrative all his own. After ruling out “regular LEGOS” (clearly, SO 2014…), he went with a LEGO Movie theme. 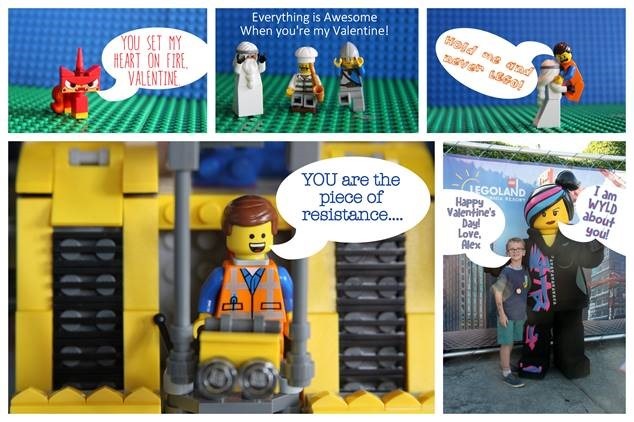 We cruised Pinterest for snarky, creative sayings that were the perfect marriage of the LEGO Movie with Valentine’s Day. Next, he set about collecting his Mini Figures and building a backdrop, planning each scene of his storyboard, deciding which characters would go with each phrases/themes. Verbal whiplash….over Valentines. Over LEGOS. The holiday focused on demonstrating love and affection through sentimental words—peppered with yelling and cries for independence. After getting all the shots we hoped for, the game had finally concluded and my blood pressure could lower itself a bit. We trooped upstairs to sit down with the photos and start editing and designing on Picasa. Realizing we needed word bubbles and new fonts, we started researching, with Mom at the helm. Quickly, though, I realized I needed to move to the stool and let him take the reins. I am an elementary school teacher and after fourteen classes of students, you’d think I would apply my pedagogy to my own parenting. Growth, learning and progress are never made by doing the work for the students. My current job share partner has perfected and modeled the phrase for me, “The only way the work goes away is if you do the work.” It would seem so much easier to just do it for them—say the word they are painstakingly sounding out, tell them the answer to multiplication fact they can’t recall, help make their paragraph flow with some choice words or ideas. But we all know that that won’t lead to independence. Rather, it is a delicate balance of guidance, support, silence, and presence that will get us there in the end. So I sat on my hands. I tried to use calm words as I directed him through the steps. And over an hour later, he’d finished. 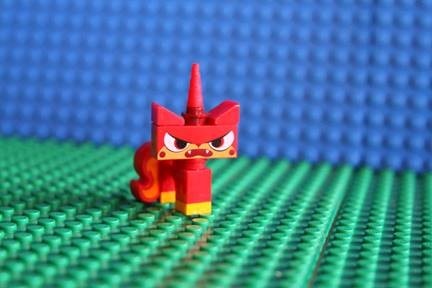 And we both survived, mostly unscathed, even if my face resembled Angry Unikitty behind his back. Are there spiritual implications for these moments with our children? The daily practice of letting them learn and grow in independence? The hourly opportunities to bite our tongues and let our kids even fail, knowing growth may be on the horizon? I can only imagine the uncountable moments that God doles out patience, supporting us as we slog through the unknown. Watching our decisions when we find ourselves in the frustrating moments when we can choose to grow or stay fixed in our mindset. I’m guessing God doesn’t sit on hands or roll eyes to cope, rather sees the potential in the rocky road ahead. The Holy Spirit shows us the way we should be walking in too…serving as an advocate for our children. A counselor and helper. A strengthener. Not always dishing out words, advice and “let Mommy just do it for you”….but standing with them, guiding, often as a silent presence. This approach to my role as Mom feels impossible to me on most days as I use words, LOUD words, to “guide”, as I am forced to sit on my hands or take a break in my own room behind a locked door to keep myself in check. But as we seek to have this mindset, the mindset the Holy Spirit graciously takes with us, we will realize the reality that we aren’t sent out to do this work alone. We are given this same Comforter, Advocate, Strengthener and Counselor to help us and walk alongside us, even when our own words and actions scream, “Just let ME do it!”. Great post, Christine! I can so relate to your struggle with just wanting to do it for them. My older son really wants to do his school projects for himself and last year finished a little diorama and then insisted on taking it to school the next morning, several days before it was due and before I’d even had a chance to look over the notes for misspellings or offer any ways we could “improve” it together. It was not perfect, but for him it was ready to go and he was really proud, so it was a good lesson for me in stepping back and being grateful for his self-motivation. Thanks for your words!